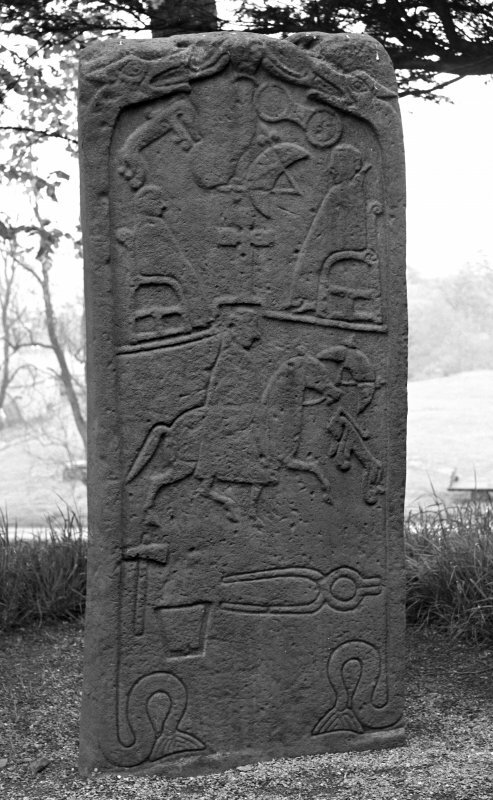 Dunfallandy, Pictish cross-slab. From J Stuart, The Sculptured Stones of Scotland, i, pl.xlviii. View of face of Dunfallandy Pictish cross slab. 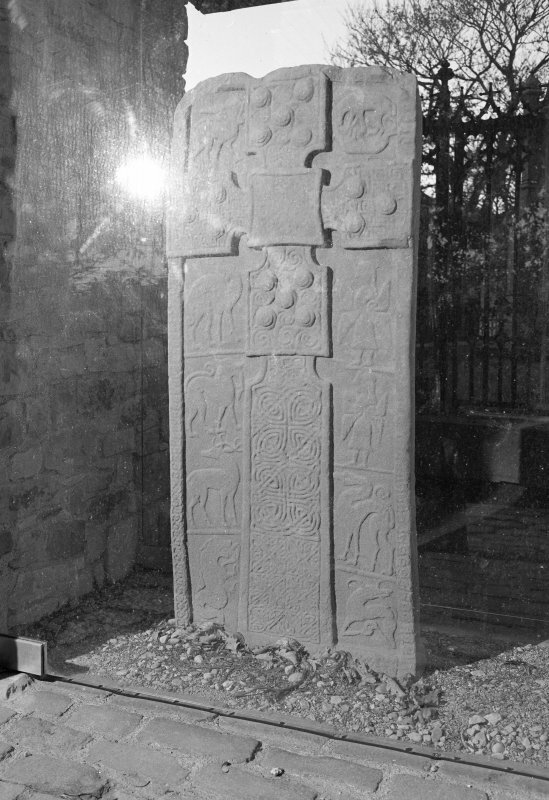 View of reverse of Dunfallandy Pictish cross slab. 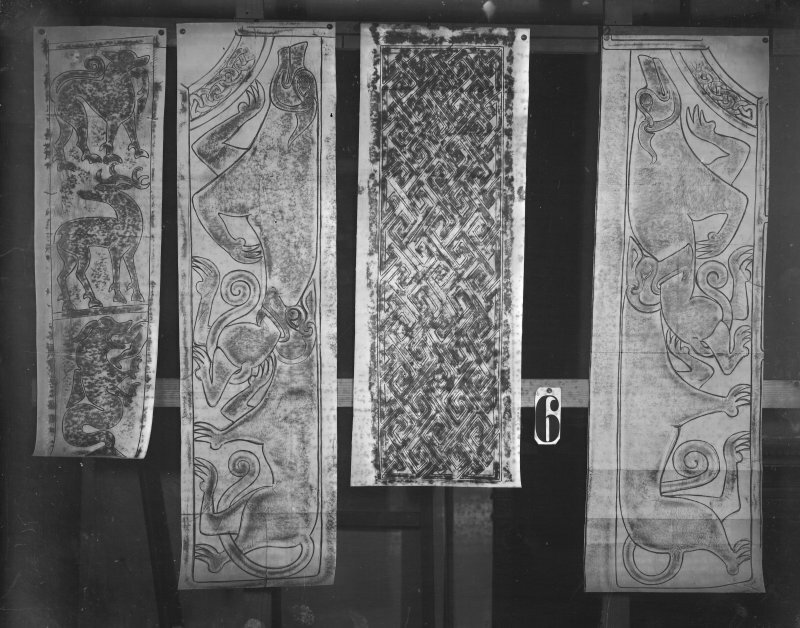 Photographic copy of four rubbings. 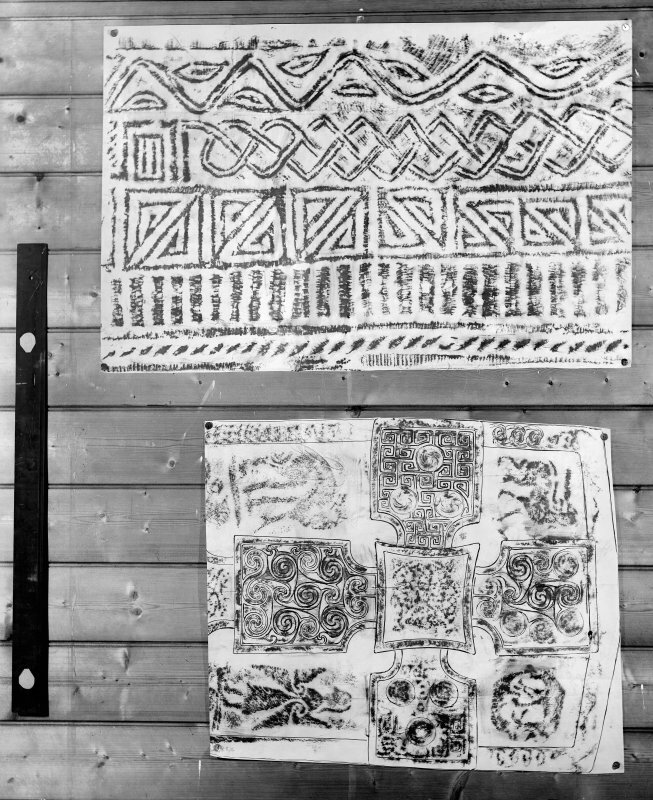 The right and middle-left rubbings depict sections from the face of St Madoes Pictish cross slab. The left rubbing shows the left side of the face of Dunfallandy Pictish cross slab. The middle-right rubbing is unidentified. 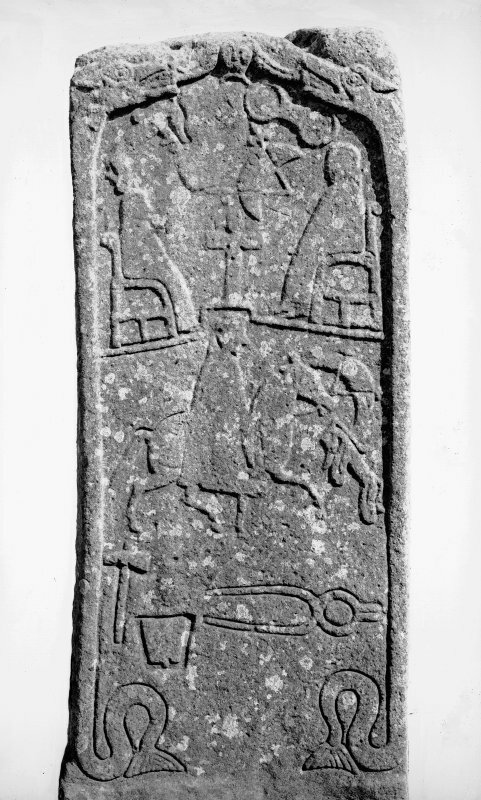 Dunfallandy, Pictish cross-slab. 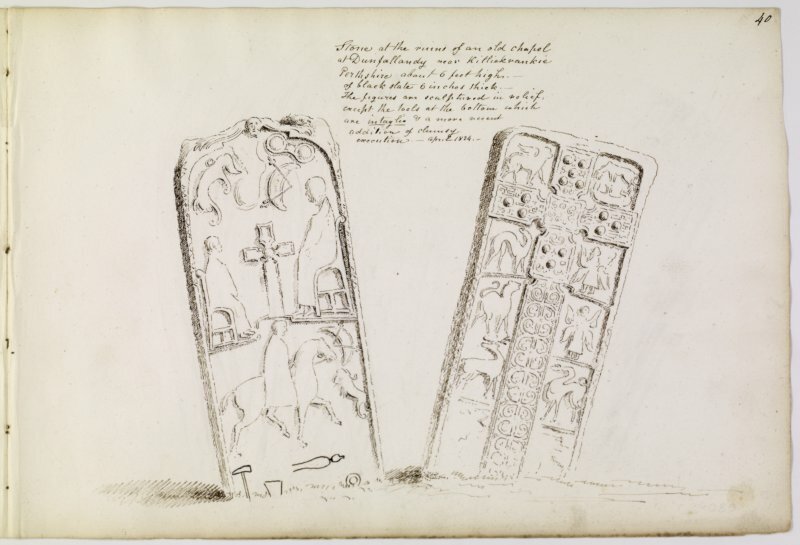 From J Stuart, The Sculptured Stones of Scotland, i, pl.xlvii. 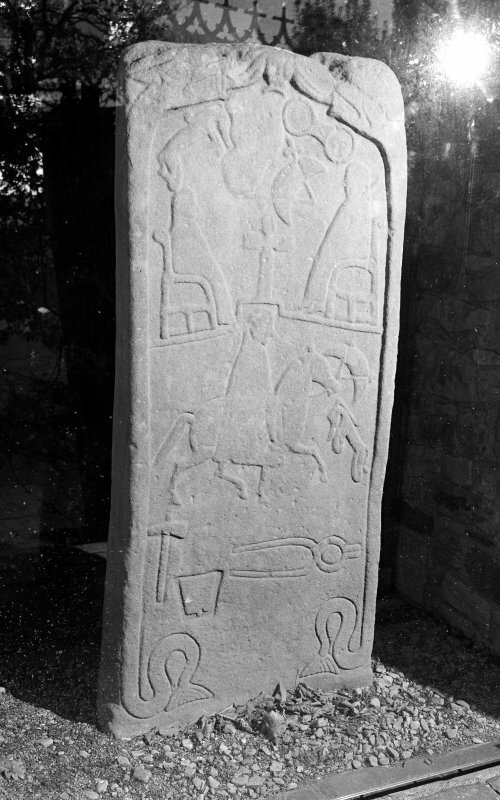 View of reverse of cross-slab. View of face of cross-slab. From J Anderson (1881), 'Scotland in early Christian times', p.67. Annotated drawing of both faces of cross slab from album, page 40. Digital image of PTD/310/1/P. 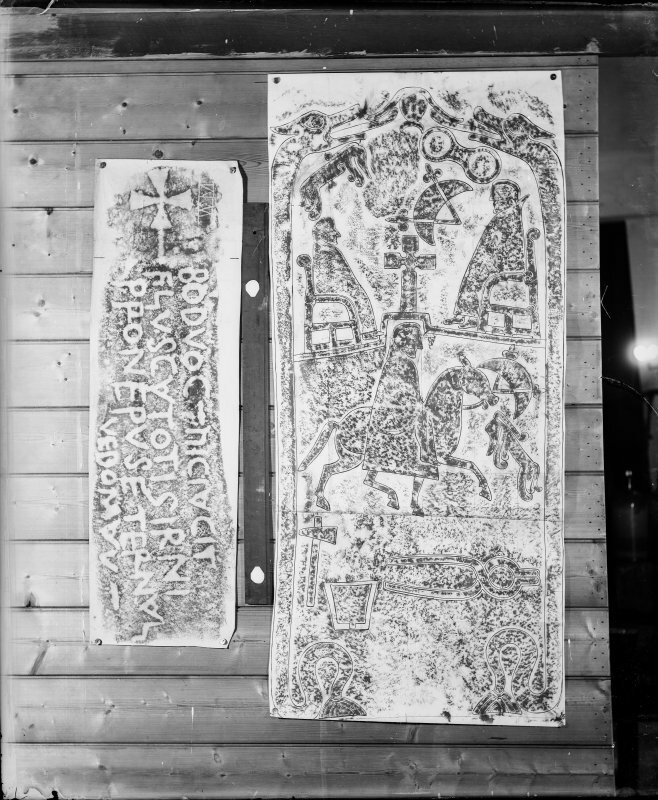 Photographic copy of two rubbings. The upper rubbing is yet to be identified. The lower rubbing shows detail from the face of Dunfallandy Pictish cross slab. Present location: in situ at Dunfallandy. Evidence for discovery: recorded close to the site of an old chapel by Skene in the 1830s. It is aligned in such a way that the cross faces west, and since the 1970s it has been protected by a glass cover. Present condition: weathered and some damage to the top edge. A large rectangular slab, this is carved on both broad faces in a mixture of relief and incision. Face A is bordered by a flatband moulding ornamented with interlace and an equal-armed cross on a shaft occupies the entire height and width of the slab. It is framed by a roll moulding and has square terminals and a square centre. Each of the side arms contains three high-relief spiral bosses in high relief, set against a background of key pattern. The top and lower arms each bear five similar spiral bosses, here set against a background of spiral work. The central square panel contains a roundel of interlace pattern, but, although its roll-moulded frame is in higher relief than the arms, the roundel is not in high relief. The shaft, which has a cusped top, bears two panels of interlace, the upper based on spiral interlace and the lower on triangular interlace. 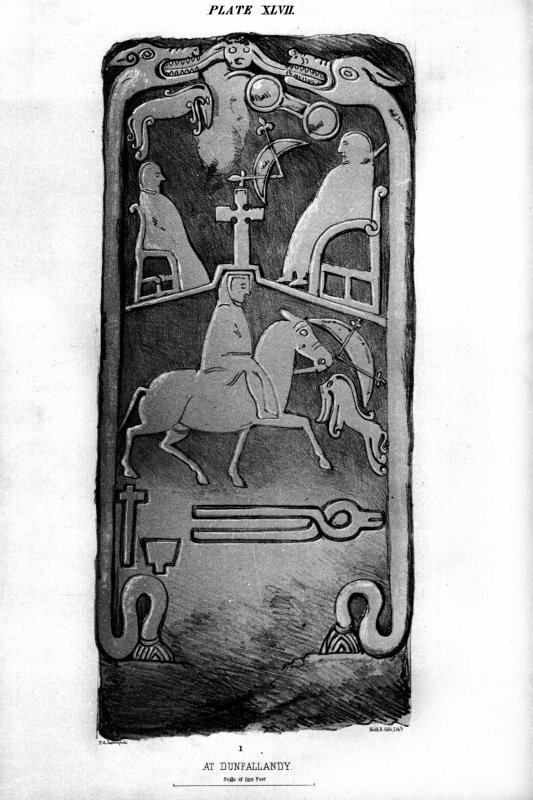 The background to the cross is carved with animals and angels, mostly facing the cross. Flanking the upper arm on the left is an animal with a human head and long hair, while on the right an animal tramples on another. There are three panels on the left of the cross-shaft, separated by roll mouldings: a long-legged animal with pronounced dew-claws looks over its shoulder, above an animal with a small carcass hanging from its mouth and a stag, and in the basal panel an elaborate rendering of Jonah and the whale. To the right of the shaft are four panels containing, from top to base, a long-haired angel with double wings, another similar angel, a very long-legged animal with pronounced dew-claws and a very long neck, and a seated deer biting its own tail, with its front and rear claws clamped together. Face C is carved in relief, false relief and incision with figures and symbols. It is framed by two elongated creatures with animal heads at the top of the slab and fish tails at the bottom, and the carving becomes gradually shallower towards the base where the sinuous tails are simply incised. The heads have flattened ears and oval eyes and the jaws are parted to allow long protruding tongues to lick the frontal human face between them, whose long hair lies along their tongues. 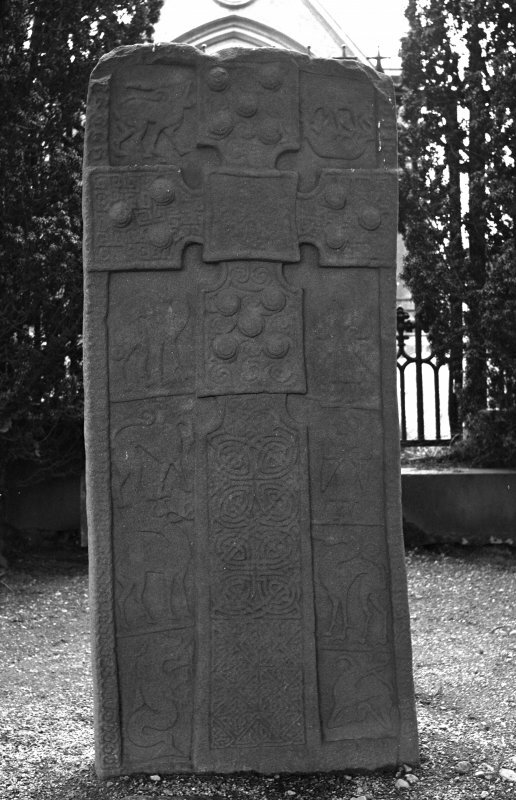 Beneath the three heads are three symbols: Pictish beast, double disc and crescent and V-rod, carved in relief with a blank area between then where the background has not been reduced to the same level. Beneath the symbols is a free-standing cross with rounded armpits set centrally on a flat base. The base is carved as a roll moulding which extends on either side to form the ‘floor’ on which two chairs stand, facing the cross. Each of the chair backs is decorated at the top and at seat-level by incised spirals. On the chairs sit two clerics in full-length robes with hoods, the cleric on the right being larger in size than that on the left. Beneath them there is another robed cleric riding a horse towards the right, and the cleric’s head fits neatly into the base of the cross. The horse is trotting, and the cleric sits on a large saddle-cloth. Immediately in front of the horse are two symbols carved in relief, a crescent and V-rod above a Pictish beast. The space behind the horse and rider is again left empty and raised above the background level. There are three more symbols below, a hammer and anvil carved in false relief and an incised pair of tongs. References: Skene 1832, 40; ECMS pt 3, 286-9; Fraser 2008, no 181. Dunfallandy Stone or "Clach an t-Sagart" an 8th century Pictish cross-slab (S Piggott and W D Simpson 1970) of old red sandstone, 5' high by 2'1" wide and 5" thick. It is sculptured in relief, one side ornamented with a decorated cross and nine side panels containing a figure of Jonah, beasts and angels. 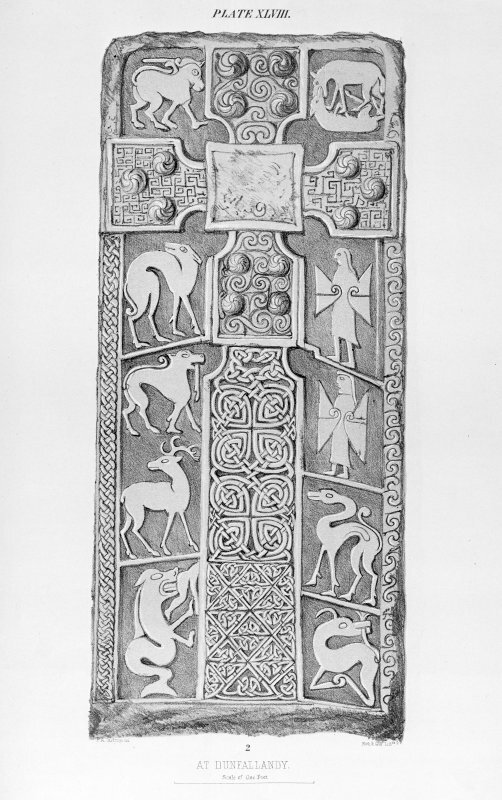 The motifs on the other side include two Crescent and V-rod symbols, two "elephant" symbols, two saintly seated figures said to represent SS Paul and Anthony, a warrior on horseback, an anvil, a hammer and a pair of tongs, all contained within a border composed of two elongated fish-tailed beasts. When described in 1856, it stood in the ruins of an old chapel a mile SW of Killiecrankie railway station (see NN96SW 20), and it has since been moved to its present position, behind Dunfallandy House. R W Feachem 1963; J R Allen and J Anderson 1903; J Stuart 1856; S Piggott and W D Simpson 1970; NMAS 1892. NN 9462 5653. 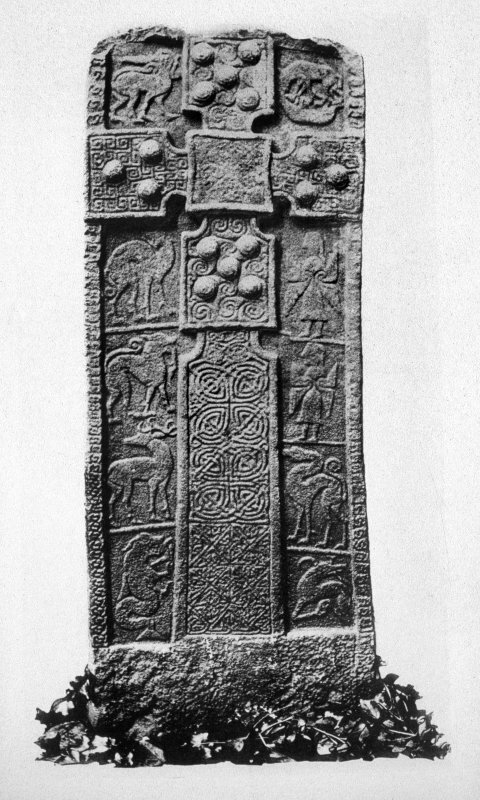 A fine example of a Class II Pictish cross slab, measuring 1.5m high by 0.6m by 0.1m. It is known as the "Dunfallandy Stone"
Visited by OS (J B) 6 Feburary 1975; H Mitchell 1923; Information from DoE plaque. In a letter to Mrs D N Bailey, R B K Stevenson points out that Romilly Allen misinterpreted Stuart in assuming that the Dunfallandy Stone had been moved, confusing the sites of two chapels at each end of the Pass of Killiecrankie. The New Statistical Account (NSA) and OS 6"map of 1863 tend to confirm that the stone had always stood near the site of the chapel at Dunfallandy. Dixon corrected Allen as far back as 1925. NSA (S Cameron, written 1842) 1845; J Dixon 1925; J B T Christie 1970; Information contained in letter from R B K Stevenson to Mrs D N Bailey, 29 July 1984 (in NMAS). Class II symbol stone. On the face are beasts and angels beside the cross.On the reverse are two seated figures, SS Anthony and Paul, above which are an elephant and a double-disc over a crescent and V-rod.Below is a mounted figure,with a crescent and V-rod and an elephant in front and a hammer,anvil and pincers underneath. 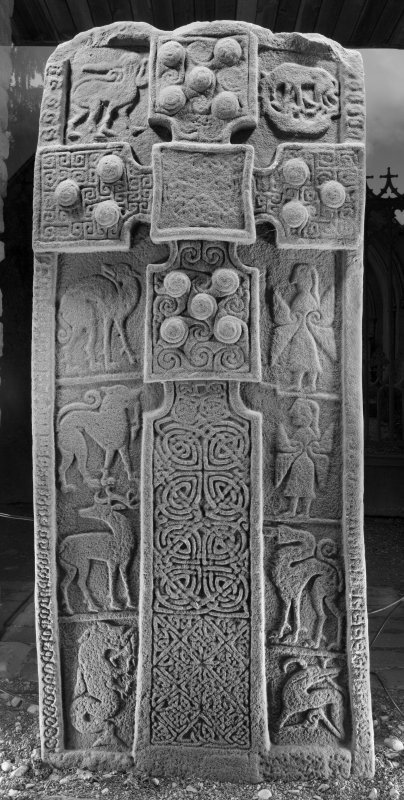 This splendid Pictish cross-slab has survived in good condition, its carving still crisp apart from the central panel of the cross-head, which must have been deliberately defaced. The rest of the cross bears intricate ornament and symmetrical arrangements of bosses on the arms, and the background is neatly filled with a series of animals and winged fIgures. Both sides of the slab have a raised decorative frame, that on the back taking the form of a pair of fish-tailed, animal headed monsters, apparently licking a human head. There are several small symbols: a Pictish beast, double disc and crescent and V-rod above two clerics seated on either side of a miniature cross, another Pictish beast and crescent and V-rod accompanying a horseman, and below a hammer, anvil and tongs. 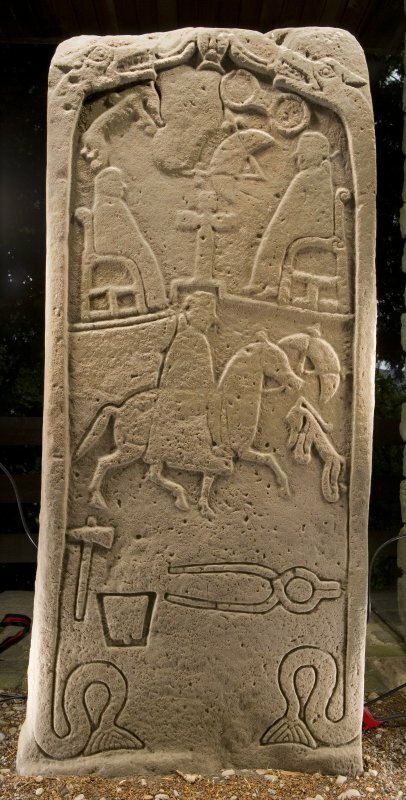 A small Pictish cross-slab may be seen not far from Dunfallandy, in the churchyard at Logierait (NN 967520); although damaged, the lower part of a horseman survives on the back, along with a serpent twined round a straight rod, while the front bears a decorative cross.